Our church is a heritage building. 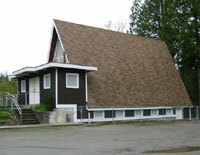 Also on the property is a modern church hall with kitchen facilities. 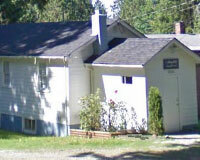 Sunday school is held here. Our parish is growing each year, but remains small and personable. All members are hard working, dynamic, and devoted. Our logo: “Diverse people, inquiring minds, open hearts. Everyone knows your name." Church service every Sunday 10:00 AM. Coffee, refreshments and fellowship after the service in the church hall. Numerous seasonal events take place such as the spring plant and bake sale, pancake dinners, apple tea and bazaar. Wildwood Fellowship Church is a family oriented, nondenominational church that believes that all people matter to God. We welcome you to join us for our Sunday Worship services at 10:30 a.m. Our desire is that those who attend leave with practical help from God’s Word to meet the challenges you face in your daily life and then be encouraged as you fellowship and get acquainted over a cup of coffee following the service. Our Super Church program runs during the service for children up to age 12. An open invitation is given to everyone to participate or attend our meetings and events. We are serious about our faith and worship of God. But we also believe that God intends his people to enjoy life and each other. Our music is a vibrant mix of old and new - something for everyone. Coffee and refreshments are served free of charge every Sunday following the worship service. Our vision is to advance God's kingdom by proclaiming Jesus as the Way, the Truth and the Life. Through Christ we discover the way to live, the way to love, the way to God. One of the ways that Jesus demonstrated God's kingdom was by assisting people who were in need. The Living Way Church will also respond where possible to authentic needs in the community of the church and the neighborhoods where our people live.